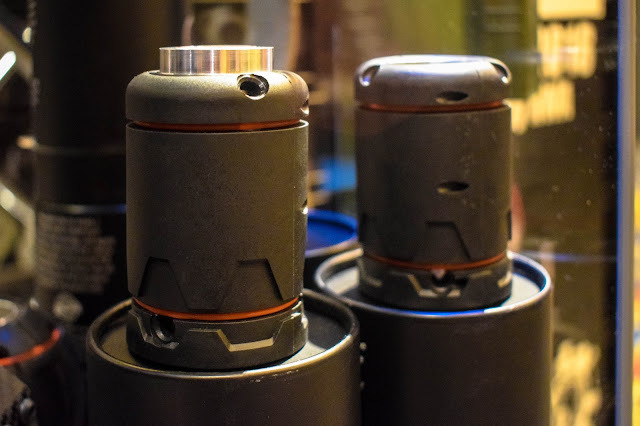 Continuing with my SHOT Show 2018 coverage, next up is day 1 of the show - in this post, we're going to look at the new products from RedWolf Airsoft, and to kick things off I'm going to look at the AVATAR grenade! The AVATAR grenade is a new, reusable airsoft grenade that uses green gas and BBs to distract/eliminate opponents. It holds 75 rounds that are discharged from 6 ports on impact. The gas charging port is located on the bottom of the grenade, BBs are to be loaded via a speedloader in the ports and the grenade is armed at the top by using a switch. 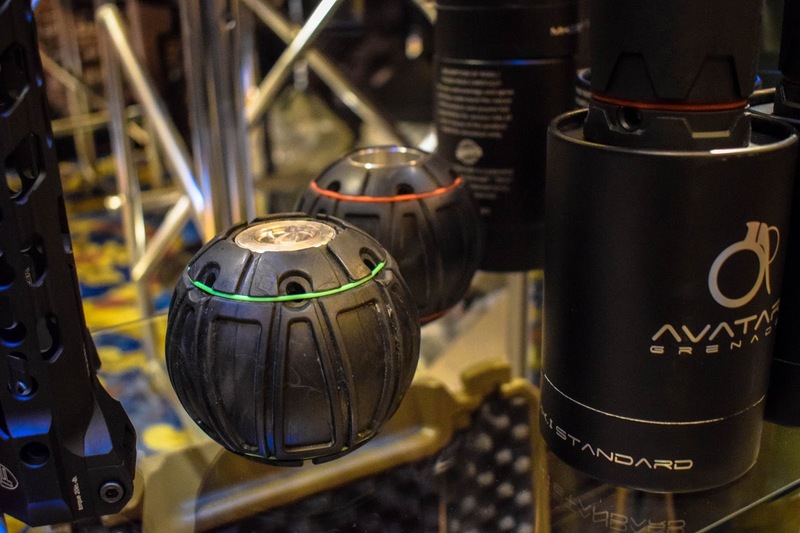 Next up is the prototype shell that AVATAR are working on - the Orb skinz, which is a spherical shell that resembles the thermal detonators seen in Star Wars. It has the same munitions as the original Avatar grenade - green gas and BBs but this holds 80 BBs and has 12 ejection ports. This shell also had a concept idea coloured light on it for SHOT Show that was located in the arming switch on the top of the grenade - which aims to make it easier to find in dark areas! The light will probably be released on it's on in the near future. Word from RWA is that this is the next stage for the Avatar grenade, and we'll be seeing impact, timed and remote control versions! And finally, we have the TM SGR 12! 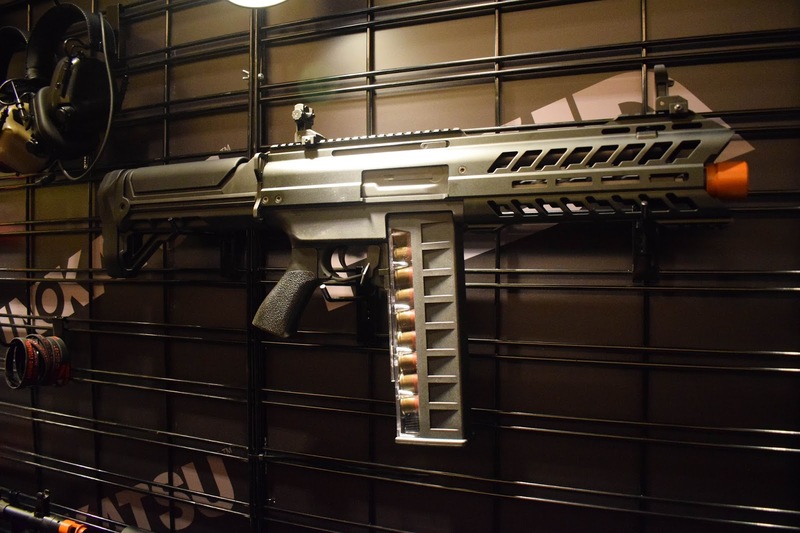 This is Tokyo Marui's new tri-barrel AEG Shotgun - it has been designed with the same internal specs as the TM AA-12! It's construction consists of an aluminium rail system that features M-Lok, a polymer body and a rubberised stock. It has, as the name suggests 3 barrels and each has its own adjustable hop-up! The magazine release is in the style of the iconic AK. As for mags/BB capacity - it comes with a 90 RD magazine but 3,000 RD drum mags are available to purchase.